Protest the Air Force Association “Arms Bazaar” | Dorothy Day Catholic Worker Washington, D.C.
Dorothy Day Catholic Worker Washington, D.C. When: Monday, September 17, 2018, from 6:00 – 7:30 p.m.
What: A Nonviolent Vigil and Prayer Service for Peace during the AFA $300+ per plate banquet (please bring a candle). As we undertake this vigil, we do so in solidarity with Campaign Nonviolence, who will be sponsoring a week-long series of actions nationwide during this time, including a special action in WDC on September 22nd. See: http://www.paceebene.org/programs/campaign-nonviolence. Where: Gaylord National Resort and Convention Center, 201 Waterfront St., National Harbor, MD 20745. American news network CNN confirmed the bomb used by the Saudi-led coalition to strike a school bus in Yemen, which killed 51 civilians including 40 children, was sold as part of a US State Department-sanctioned arms deal with Saudi Arabia. CNN cited munitions experts as saying that the weapon massacred Yemeni children dead on August 9, 2018 in Saada province was a 500-pound (227 kilogram) laser-guided MK 82 bomb made by Lockheed Martin, one of the top US defense contractors. From September 17-19, the Gaylord National Resort and Convention Center is once again playing host to the Air Force Association (AFA) “Air & Space Conference and Technology Expo,” what we call an “Arms Bazaar.” The AFA, according to its web site, is “the voice for aerospace power and the Air Force family.” The focus for this year’s AFA Arms Bazaar is: “Multi-Domain Operations: Leveraging the Full Spectrum.” (see below more info about the AFA Arms Bazaar) Some 130 arms contractors taking part in this years Arms Bazaar have played a prominent role in U.S. warmaking. These arms contractors, like Lockheed Martin, General Dynamics, Northrop Grumman and Raytheon, are profiting from war and literally are making a killing! But that’s not all. The Pentagon and numerous arms dealers are committed to U.S. nuclear/military/cyber superiority and militarizing and controlling space. The long-awaited sale of F-16 fighter jets to Bahrain has helped set a new annual record in weapon sales cleared by the U.S. State Department. The U.S. supplies weapons to much of NATO and Middle Eastern allies like Turkey, Israel, and Saudi Arabia. The Saudi’s have been using weapons from arms contractors like Lockheed Martin, to kill innocent Yemenis, including scores of children. U.S. arms sales in the Middle East are fueling widespread wars in the region, as the U.S. continues its quest to destroy ISIS. In concert with weapons contractors participating in the AFA Arms Bazaar, the U.S. is engaged in direct military intervention in Iraq, Afghanistan and Syria, continues its military support for the Israeli occupation of the West Bank and Gaza, proceeds with its military “pivot” in the Asia-Pacific to threaten and contain China, and wages its killer drone attacks in Pakistan, Afghanistan, Yemen and Somalia. Moreover, U.S. plans to spend $1 trillion over the next thirty years to modernize its own nuclear arsenal is already underway. And the U.S. Congress and Trump Administration just recently authorized $717 billion to be spent on the 2019 FY military budget. The U.S. military is also the world’s single biggest consumer of fossil fuels which is directly destabilizing the earth’s climate. The victims cry out for justice, and the earth, under daily assault, groans in travail! During its three day Arms Bazaar, the AFA is sponsoring nearly 40 forums addressing how the U.S. can refine its warmaking apparatus and cyber capability so it can dominate earth and space. On Monday, September 17, the AFA is holding a $300+ per plate banquet honoring outstanding airmen, and two days later will hold another similar banquet. We decry the AFA Arms Bazaar for what it is: a scandalous affront to God, a theft from the poor, and a threat to people worldwide! Who will speak for the poor and the victims, as arms dealers reap huge profits from their lethal weapons and death technology? Who will protect our sacred earth and environment? We urgently need, more than ever, to nonviolently resist all war and violence–from Yemen, Iraq, Afghanistan and Gaza, to Ferguson, NYC, Baltimore, Charleston, Charlottesville, D.C. and elsewhere. Together, let us continue to do all we can to establish the Beloved Community, end the climate crisis, eradicate poverty and create a world free of nuclear and conventional weapons, killer drones, war, racial hatred and oppression. In the name of God, who calls us to love and not to hate, demonize and kill, it’s time to end this Arms Bazaar! Please join with members of the Dorothy Day Catholic Worker, Pax Christi and other peacemakers as we seek to say YES to Life and a resounding NO to the merchants of death and war profiteers. AFA’s National Convention. ASC is preceded by AFA’s National Convention, which presents an exciting opportunity for AFA members to shape the future of AFA as a delegate. Gain new insights and skills to advance your career. Be among the first to see the latest innovations in airpower, space, and cyber capabilities all the while bonding with your fellow Airmen. Inspiring addresses from recognized leaders in your Air Force will give you drive for taking your career to the next level. You can do all of this and more at AFA’s annual Air, Space & Cyber Conference (ASC). ASC 2018 is themed “Multi-Domain Operations: Leveraging the Full Spectrum,” and will take place from September 17-19 at the Gaylord National Resort and Convention Center in National Harbor, MD, located just outside of Washington, DC. As the nation’s premier event for defense and aerospace professionals around the world, ASC brings together Air Force senior leaders and experts from government, industry, and academia. 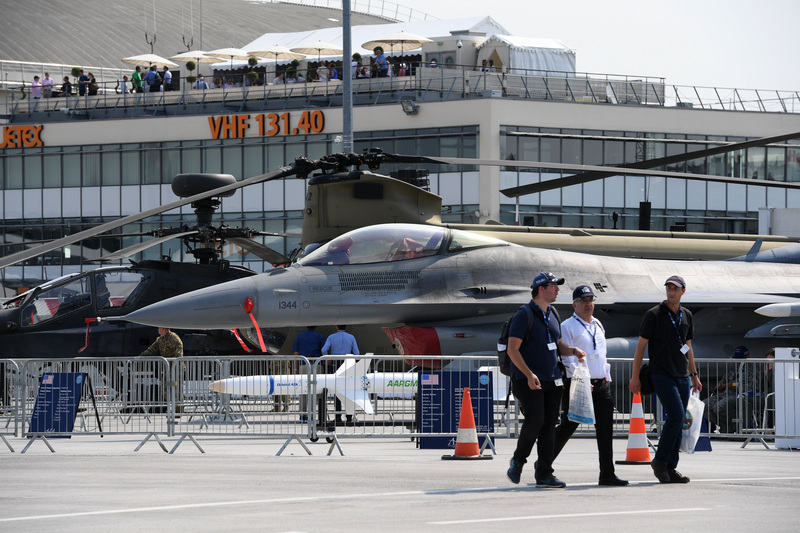 From engaging speakers and panels focused on airpower, space, and cyber developments to the technology exposition featuring the latest technology, equipment, and solutions for tomorrow’s problems, the conference has something for everyone. Take 395 South (off of New York Ave. or Constitution Ave. at 9th St. NW) Merge onto 295 South via exit on left (crossing into Maryland) – 7.4 miles. Take the exit toward National Harbor. Take ramp to National Harbor Blvd. Bear left on National Harbor Blvd. and go two blocks to St. George Blvd. Make a right on St. George Blvd. Go to one block before Waterfront St. and look for street meter parking. Also St. George Parking Garage is on right in case you can’t find street parking (just past the cross street called Mariner Passage). The garage is one block before Waterfront St., where the Gaylord National Resort is located. We will meet for the vigil at the corner of Waterfront St. and St. George Blvd. on the sidewalk in front of the Gaylord National Resort. If you are coming from Maryland or Virginia use Map Quest for the most precise route to the Gaylord. If you would like to use public transportation, take the Green Line to Branch Ave. Get off at Branch Ave. and take the NH1 National Harbor bus line. This bus takes you to the corner of St. George Blvd. and Waterfront St. across from the Gaylord National Resort. Call 202-637-7000 and select “ride guide” for best directions. Or go WMATA web site.